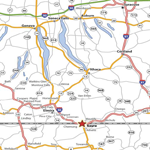 A statewide I-86 Coalition is staffed and supported by Southern Tier West/Central/East Regional Planning and Development Boards as well as the Hudson Valley Regional Council. 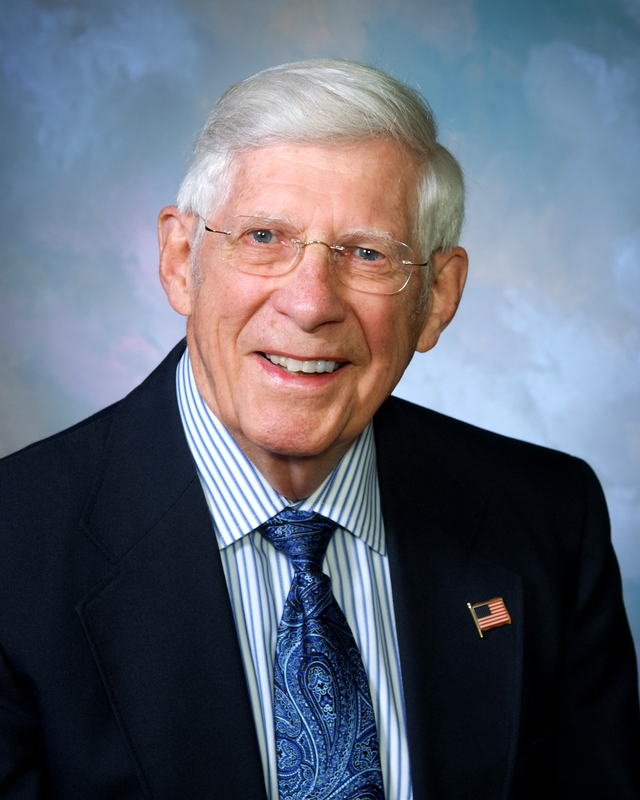 Ted Bennett is the Chairman of the I-86 Coalition. 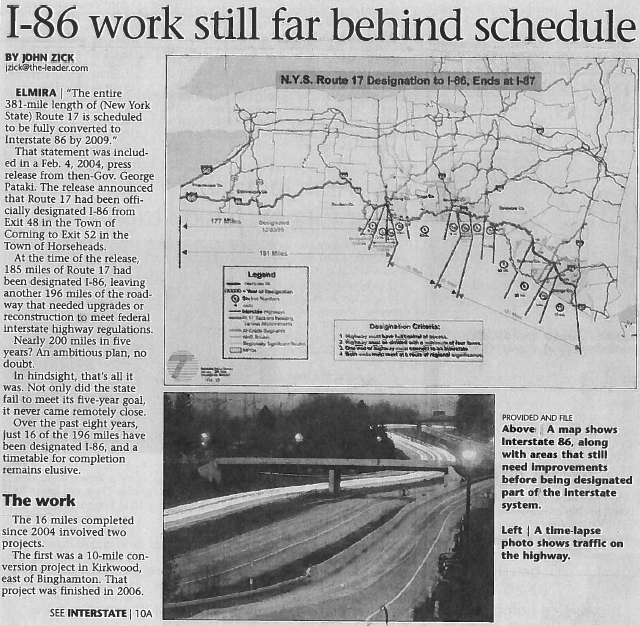 In December of 1999, 177 miles of Route 17 were designated as I-86, leaving 204 miles to be upgraded to Interstate standards. 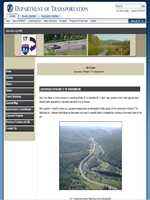 To the credit of the New York State Department of Transportation, the Prospect Mountain/Kamikaze Curve Project in Broome County has begun and remains on track. 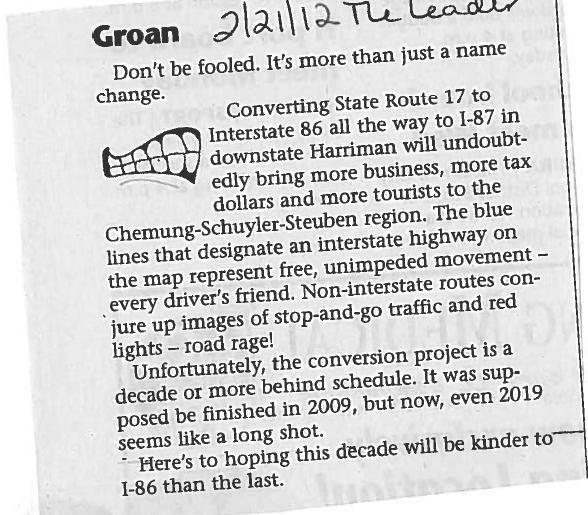 Tioga County is also now on track as to the conversion of Route 17. 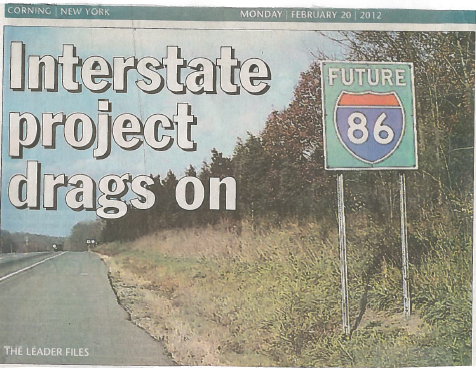 In February of 2012 I traveled the entire length of the I-86 corridor from Chautauqua County to Orange County meeting with officials from the ten counties along the route to discuss the status of completing I-86. I observed increased truck traffic and increased speeds of both cars and trucks along the entire length of the corridor, with no regard for the difference between the designated and non-designated areas. Soon after this trip I became aware that projects along the corridor were being delayed for 5 years, until 2017. 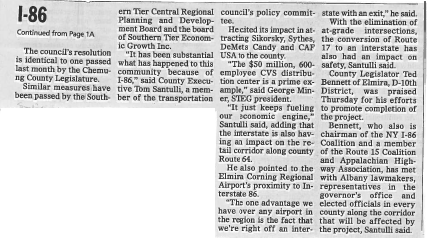 This could add another ten years to the final completion of a highway, the majority of which met interstate standards before the project began. The conversion of Route 17 to Interstate standards must be complete before economic benefit and public safety can be fully realized. New York State Department of Transportation is far enough along in the conversion that instead of delaying projects until 2017 resources could be provided to complete all the projects by 2017. Just get it done.